How does Best Price work? Most rentals appear on a number of booking sites. Hawaii Chee is different. We go beyond just showing you a live price comparison. We give you a comparison that factors into removing the website service fees on the other sites since (many of) our hosts will agree to give you the price on any site including the removal of the website fees. 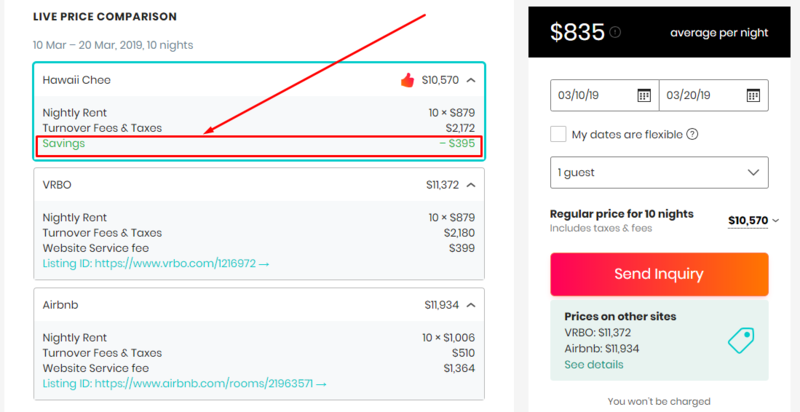 VRBO or Airbnb Price minus their service fee. When viewing a listing, you will see a price comparison with the big booking sites for sample dates. If you are on mobile, click "See rates and availability." When you enter your dates, you will see an exact price comparison. When the host has already committed to providing the best price, you will see “Savings” in the price details. This way you can see how much you save by booking direct.